Keep Moving Movement: Get Ready to be Burnt! Get Ready to be Burnt! The forest fire burns even trees like sandalwood. The sandalwood tree represents us. Animals ignore almost everything that doesn't affect them directly. Humans should not. Destructive habits slowly but steadily creep in and annihilate us. A child speaking rudely and the parents still pampering the child. Child develops disdain and arrogance. An employee bad mouthing the organization and the management turning a deaf ear to it. The employee takes the management for granted. A top performer being indiscipline and the boss turning a blind eye. Sincere and disciplined employees lose motivation and impetus to stay disciplined. A friend wasting his time, money, energy with wrong company and genuine friends just shrugging their shoulders helplessly. A family member having affairs and the other members pretending time will correct him. A youth driving his bike super fast and other friends egging him on. Someone lying and we protecting him in the name of friendship. We are satisfied by being the sandalwood tree. We believe we have done our 'job' by weak protests when a strong standpoint was required. This is how tragedy begins. The sandalwood tree cannot do anything to protect other trees or itself. As a human being, you and me, can. An evil person or a misguided person, will have no hesitation in hurting a good person. A good person must ensure that they have sufficient safeguards for themselves. A sandalwood tree lacks in safeguards and it burns in a forest fire. 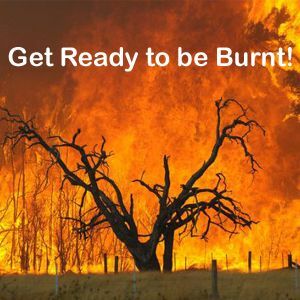 Even if you are sandalwood, if your company is that of a tree that will sooner or later catch fire, "get ready to burn". “Being good is NOT enough”. Being effective is necessary.